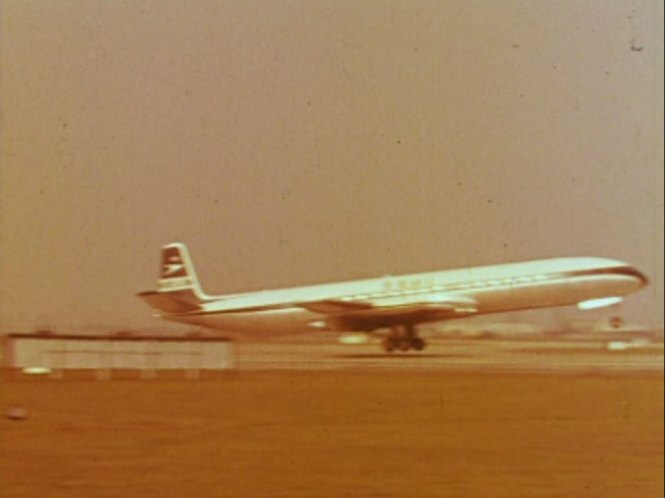 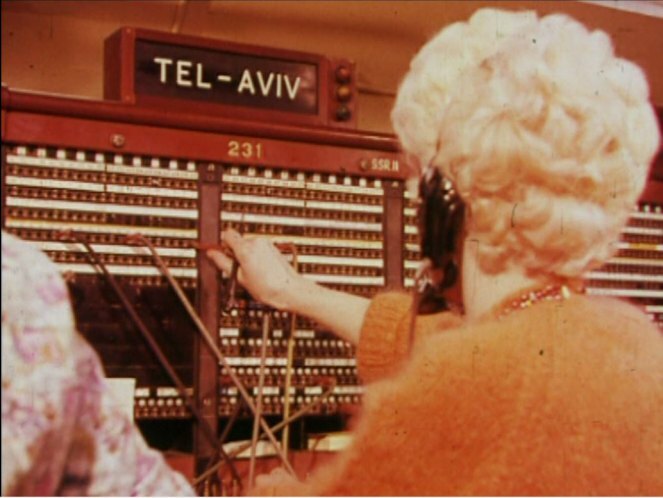 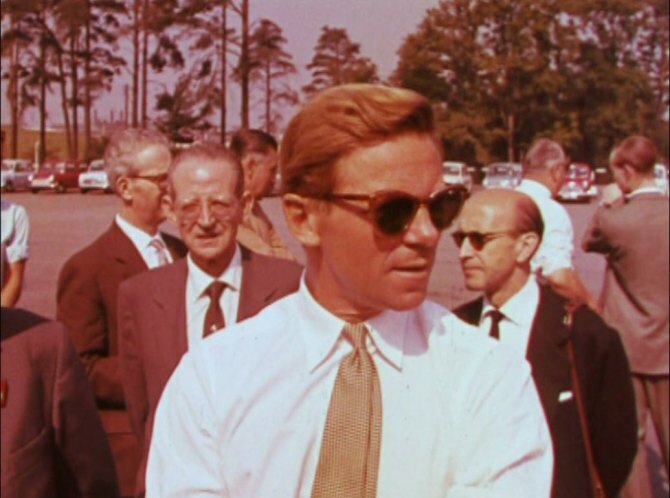 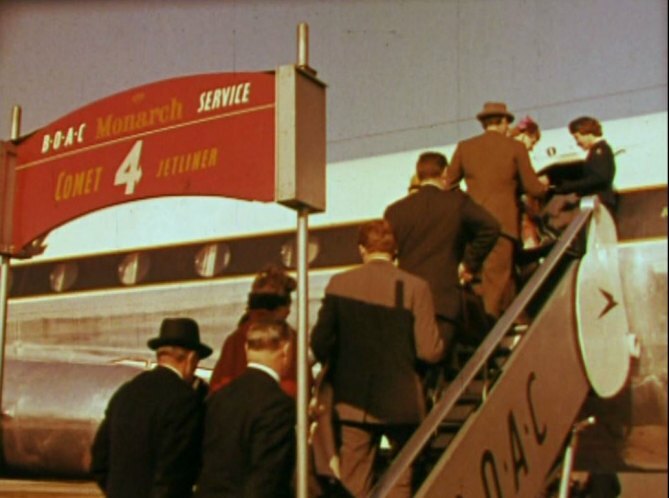 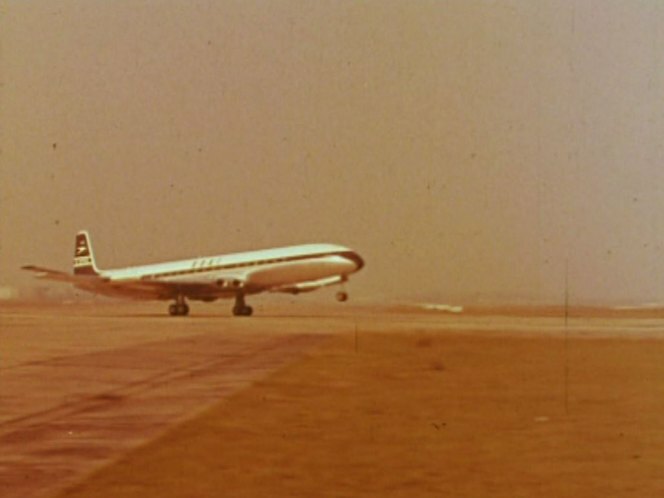 Slightly uncertain background - seems definitely a 1961 film from references, but mostly seems to be 1959 footage before and around Aug 59 Mini launch. 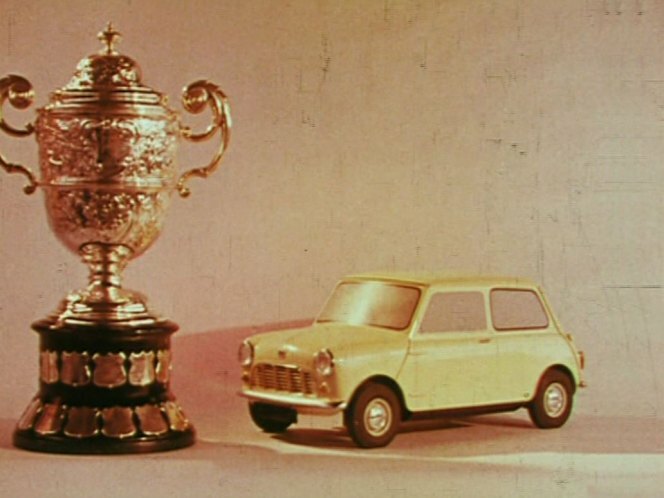 Made me wonder if it's a 1961 rehash of a 1959 original launch film - I've seen references that Mini sales were very slow for at least a year and it only realy started selling well in 61 after new marketing push, plus adoption by London trendy folk (maybe BMC loan cars??) 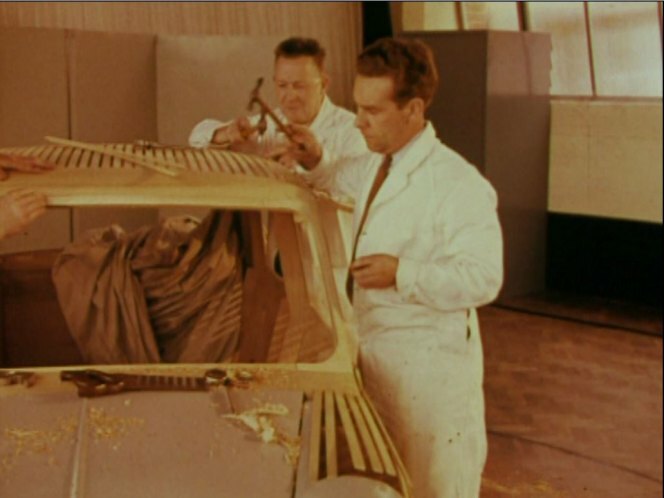 and 61 launch of Cooper/Elf/Hornet/woodie Traveller & Countryman made it glamorous. 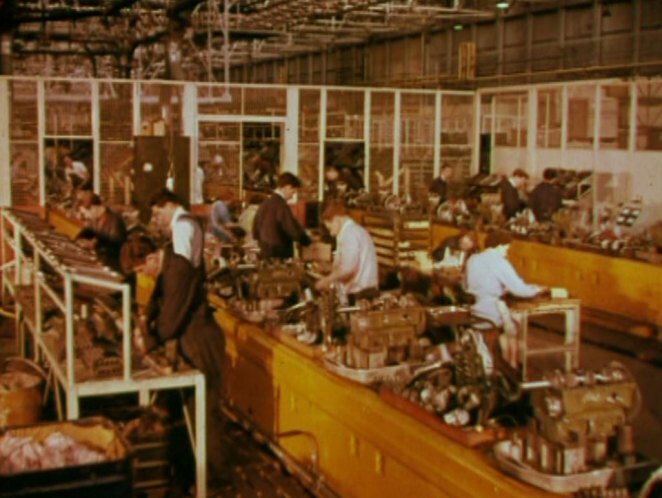 One factory assembly shot with a glimpse of a green Mini van front (so after January 60), the last title picture above has 1960 Dewar award trophy for outstanding UK car engineering, and the sighting of a mid-1960 plate Opel during the trip by 715 AOB to the coast suggests some mid-late 1960 onwards footage. 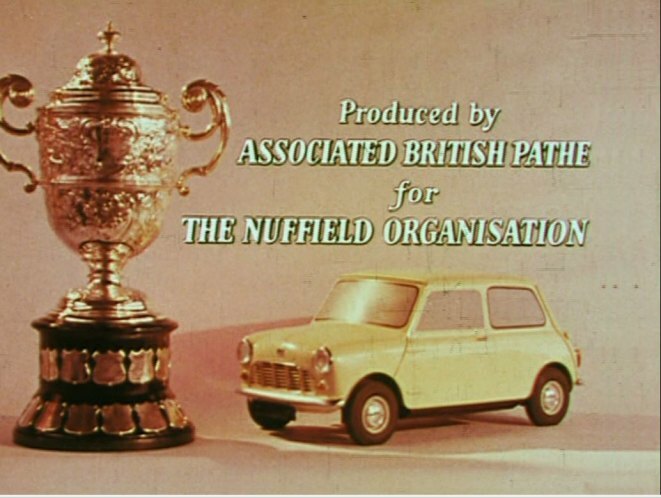 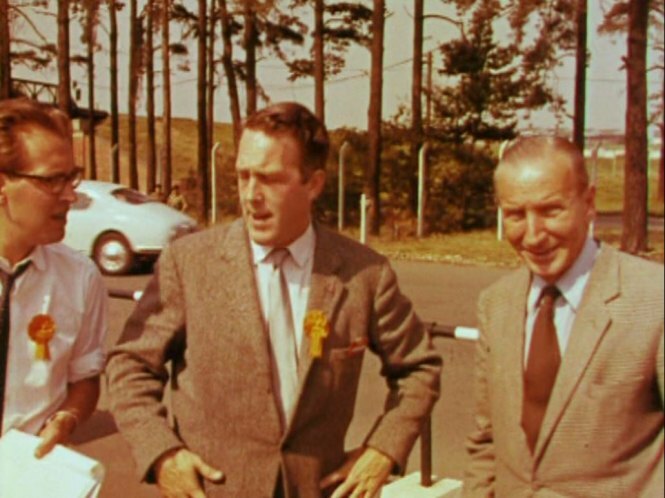 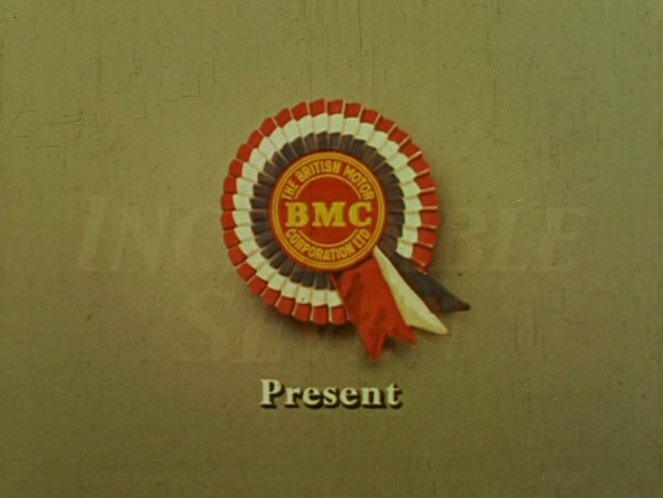 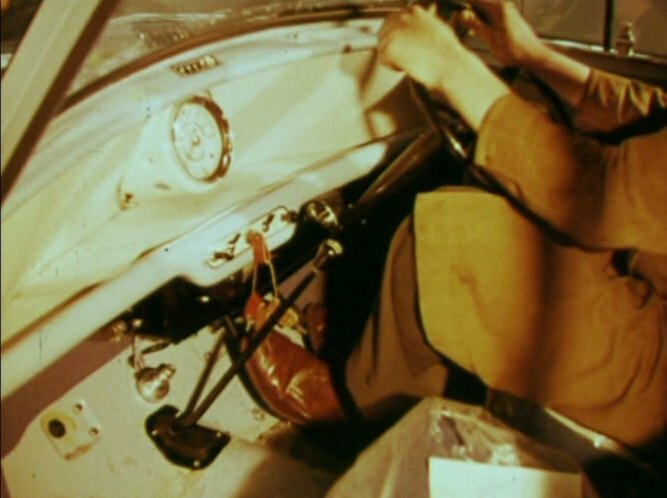 If the whole thing was completely 1961, it seems odd to include so much old and stale footage - there would be newer stuff available such as first Mini rally and race sequences to make it more exciting. 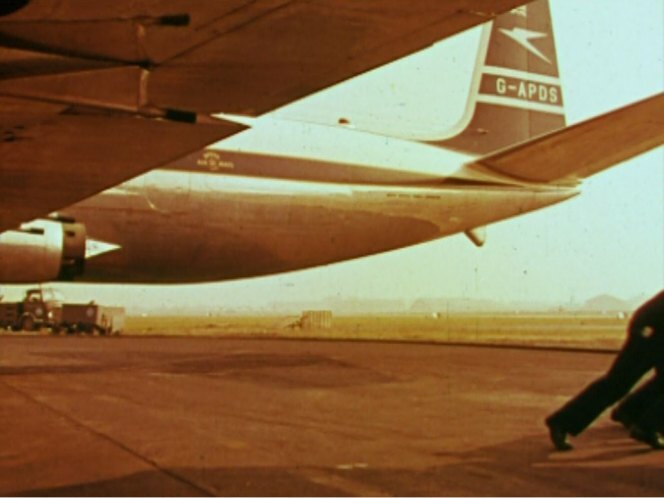 So I think it's a bodge-up film done in a hurry. 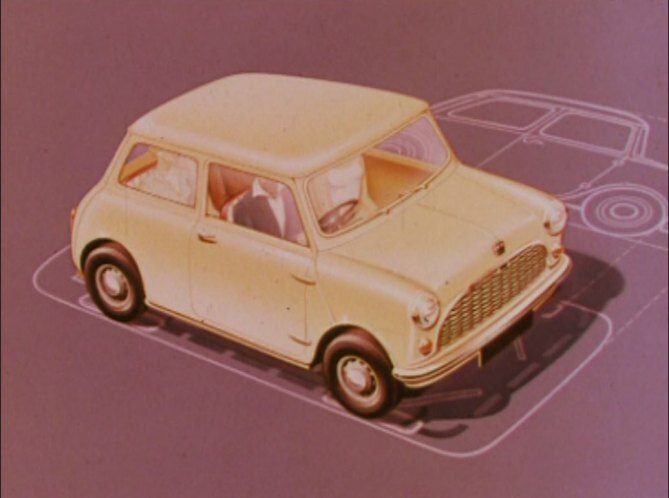 Also confusing because commentary is 100% Austin - no reference at all to Morris Mini Minor, but lots of Morris included. 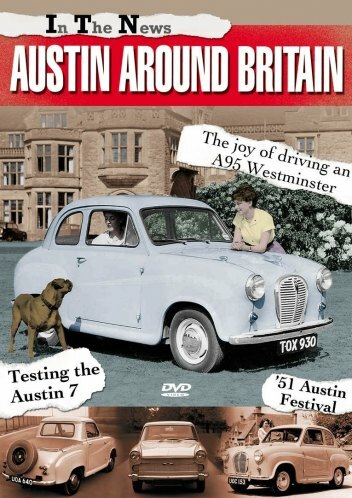 Accepted that ADO15 was an Austin Longbridge project, but this parochialism is a bit bizarre. 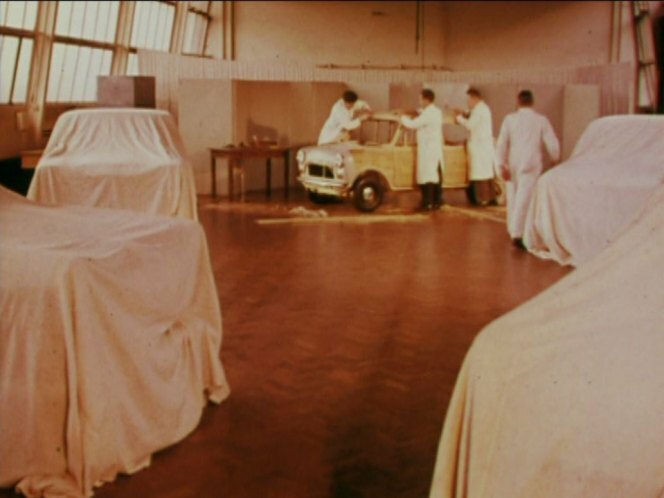 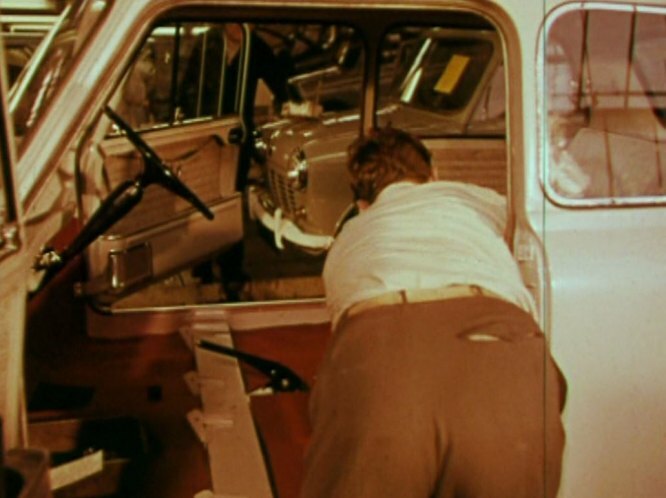 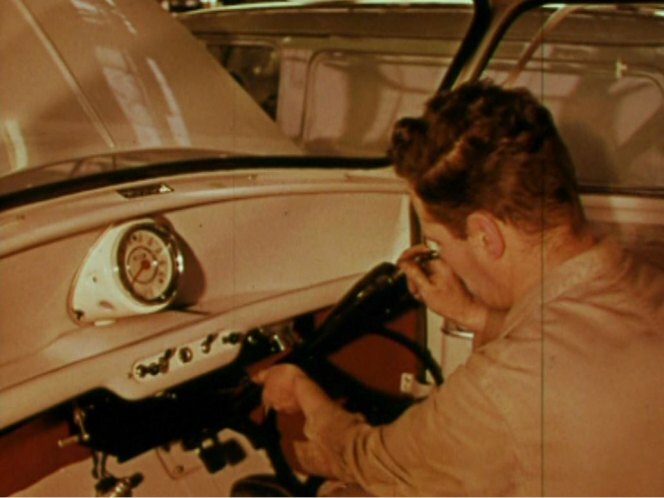 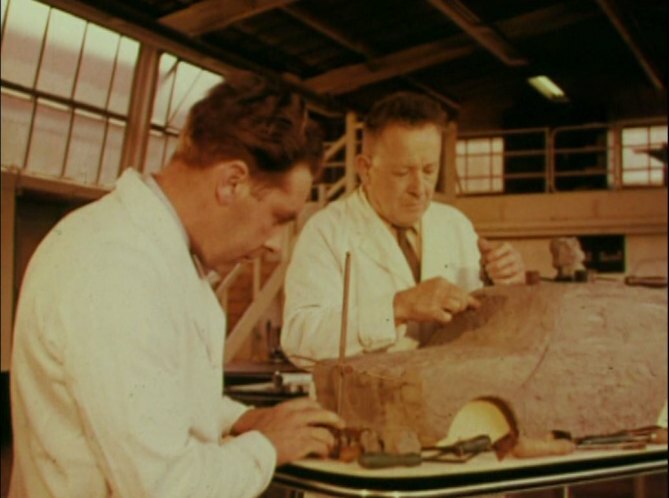 Most of the testing of the very early van-grille cars took place at Chalgrove airfield, quite close to Cowley - as seen in the film. 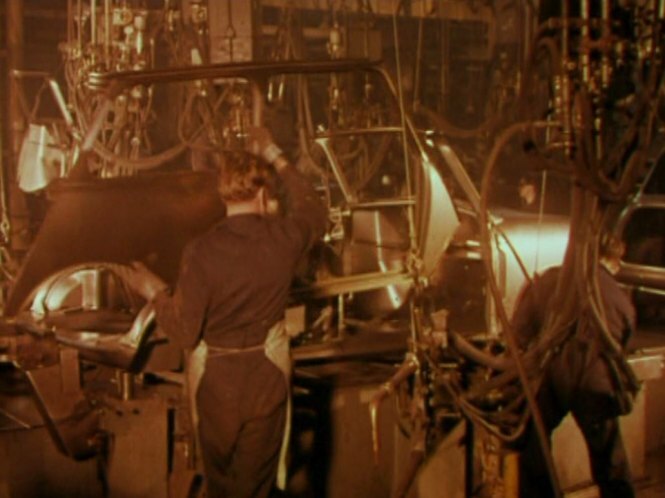 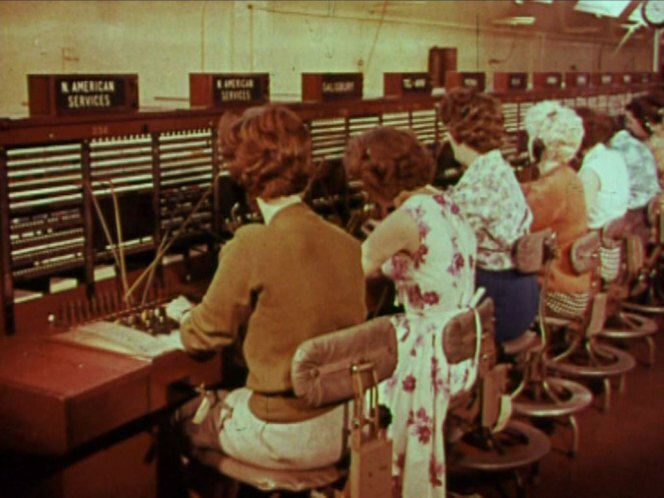 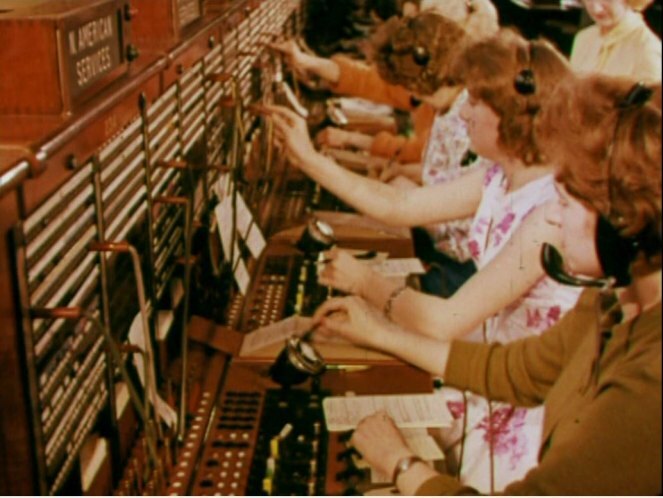 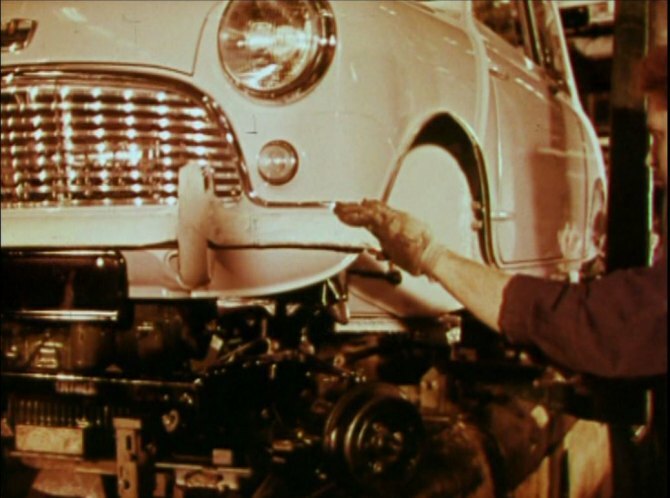 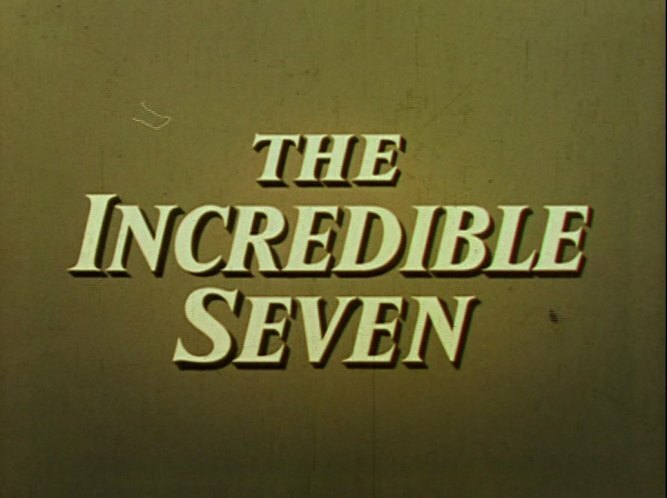 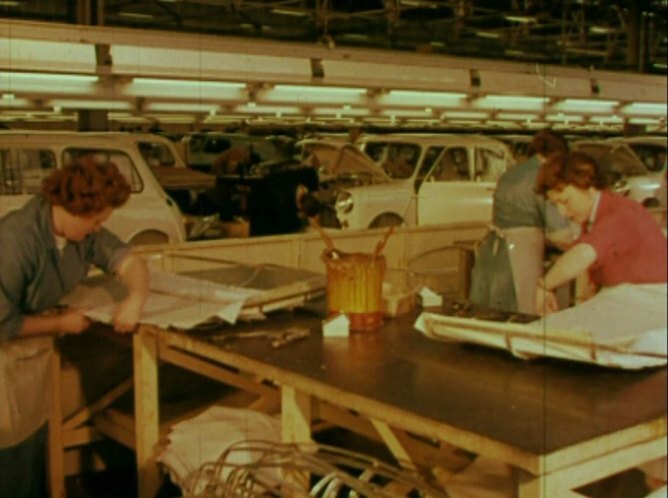 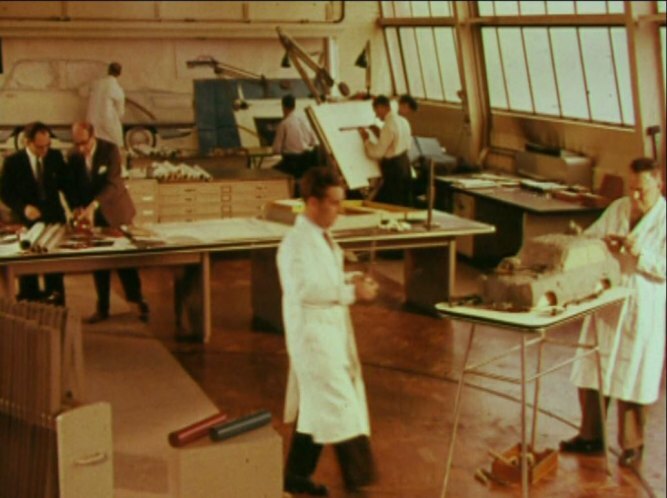 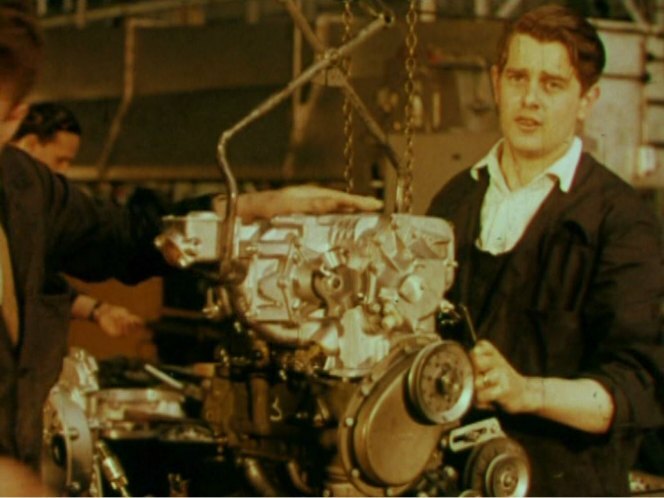 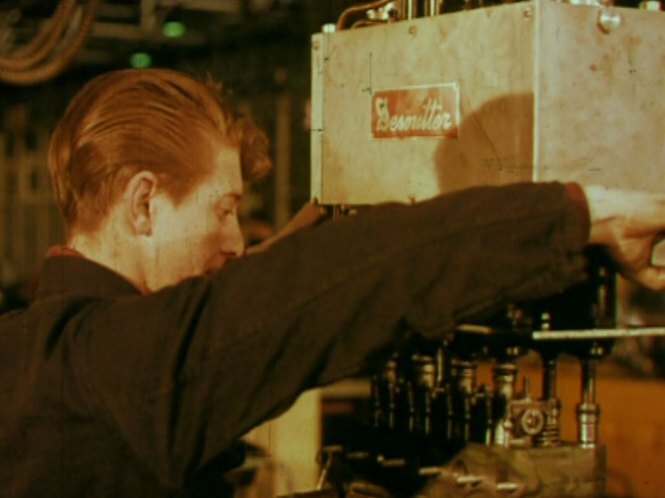 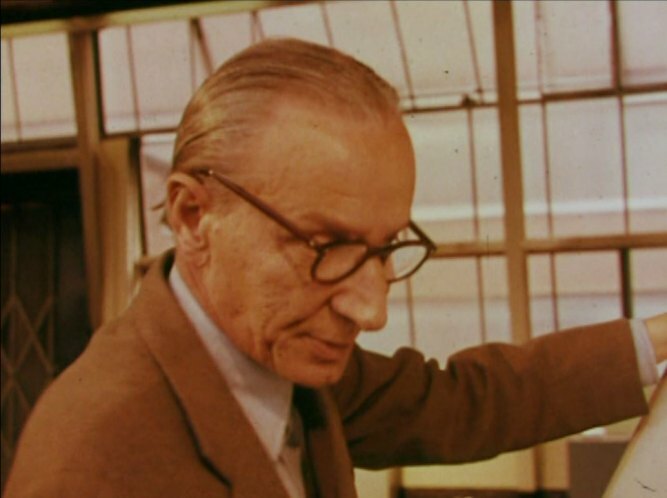 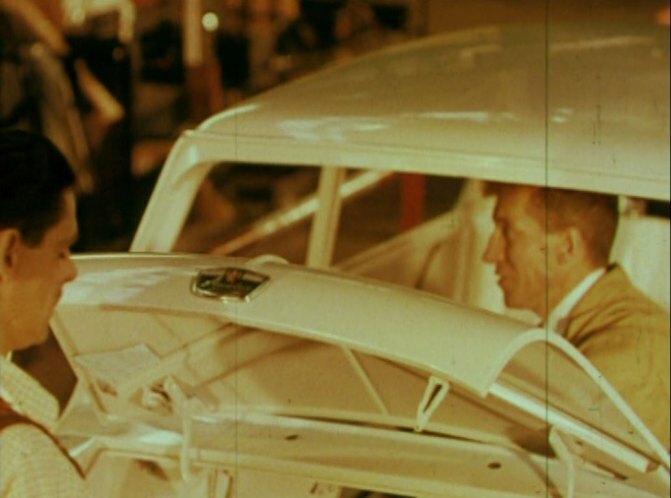 Also some factory sequences look very primitive conditions, particularly compared to mid-late 50s Longbridge sequences in other films on this DVD for A35 and A40/A50 Cambridge, so may have been filmed at Morris Cowley plant. 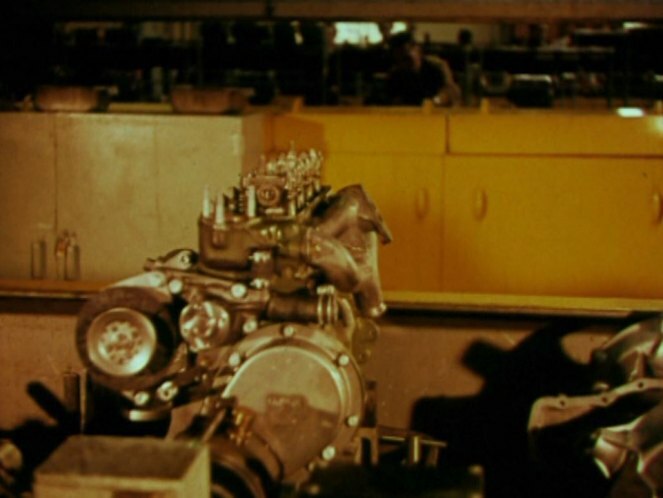 And there are continuity goofs during the sequence - cars get bits added then they disappear in the next batch of shots. 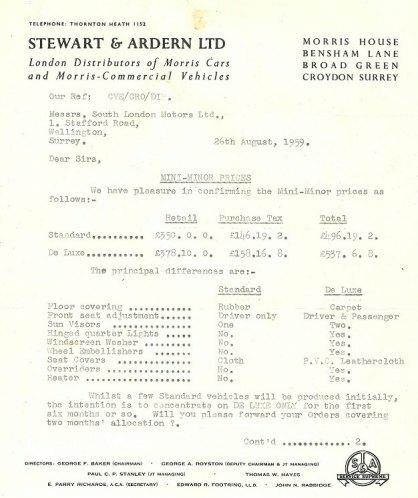 Doesn't actually make much difference for these entries, but noted that Longbridge and Cowley mixed production so that both sites produced Austin and Morris badged Minis as needed 1959-68. 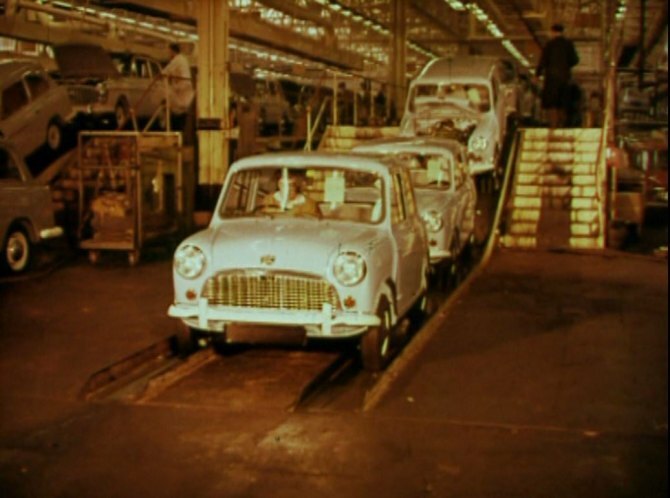 Longbridge produced its first assembly line Minis on 3 April 59 and churned out loads fairly quickly, Cowley did their first at start of May (including the legendary 621 AOK which was actually the 6th production Mini across both Austin & Morris) but was slower to reach full speed before for launch (press event 18-19 August at FVRDE - Fighting Vehicle Research & Development Establishment - track at Chobham in Surrey - lots of footage used). 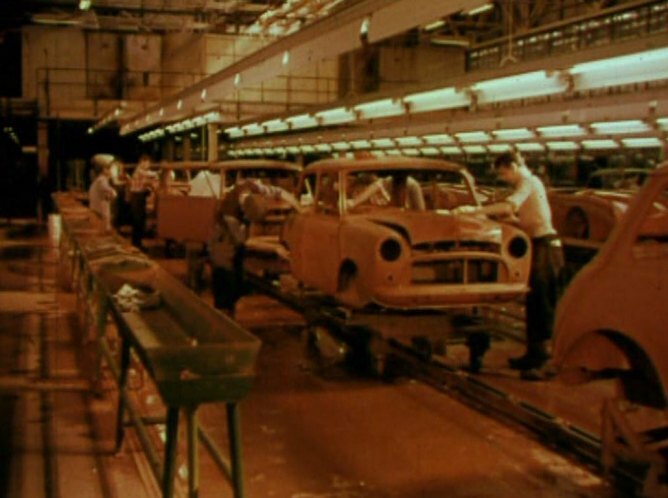 Factory - as comments above, maybe both Longbridge and Cowley sequences. 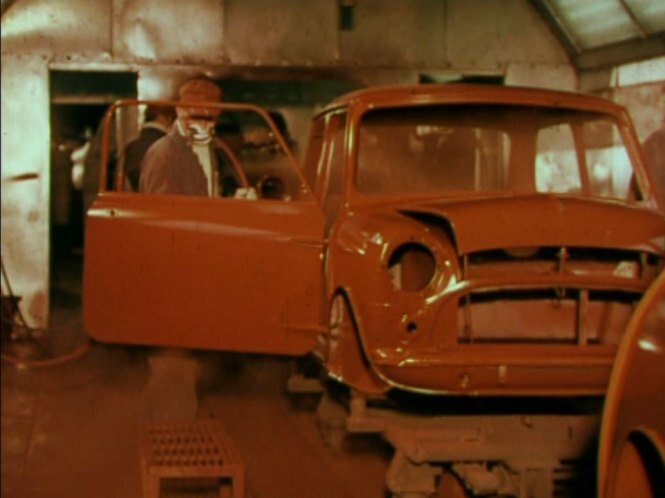 Surprised how much hand assembly in some bits. 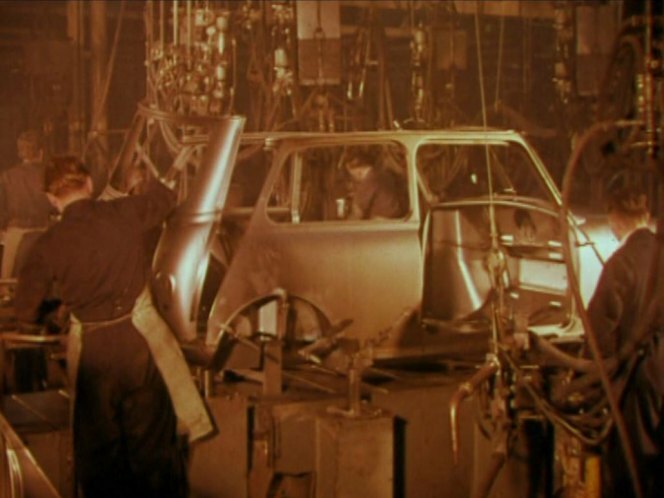 - what finned sports car would they make in same factory? 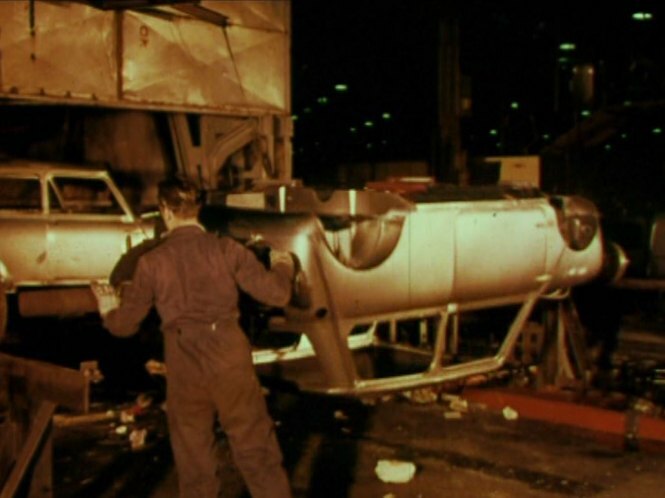 Doesn't look quite right for MGA (Cowley) or A-H 3000 (Longbridge), but not clear enough to be sure. 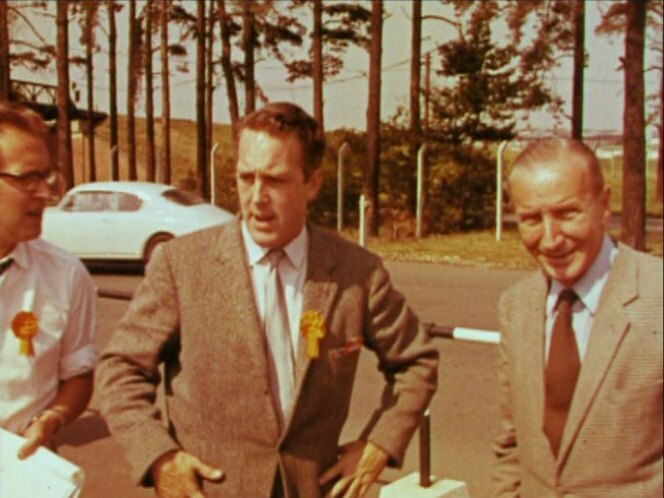 Just spotted a nice Lancia Aurelia going behind the foreign journalists at the launch (21-25) - very brief blink-and-miss-it glimpse only recognisable on slow play.